But while flagship phones are the attention-grabbers, the midrange is the bread and butter, in both old and emerging markets. ZTE doesn't have to be reminded of that, having long tapped markets such as China and India. And we're not talking Android One level of competition either. More and more compelling offers are now available below the $200 mark that are known to deliver reasonably high build quality, adequate performance and up-to-date software features. The ZTE Blade S6 is aiming even higher - in terms of both price bracket and level of equipment. A clear attempt to cater to cost-conscious but advanced users who need above-average specs and capable hardware. The Blade S90 is powered by a Snapdragon 615, the same chipset that's ticking inside the likes of the HTC Desire 820, the Oppo R5 and even half of the Samsung Galaxy A7's. Four of eight Cortex A53 cores are clocked at 1.7GHz, the rest at 1GHz. The GPU is Adreno 405 and the whole thing makes use of 2GB of RAM. The camera setup on the Blade S6 also looks quite impressive. A 13MP primary unit with LED flash is backed by a 5MP front-facer. In terms of connectivity the ZTE Blade S6 is a dual-SIM LTE-enabled smartphone. It also offers Wi-Fi ac and Bluetooth v4.0 connectivity. Interestingly, the Blade S6 comes with Android 5.0 out of the box, placing it among a select few devices, especially the ones coming from China. Designwise, the ZTE Blade S6 has iPhone 6 written all across, including a cheeky "Designed by ZTE in California" inscription on the gray-painted, curvy body. The camera placement is also borrowed from Apple - it is impossible to not notice the similarities. The ZTE Blade S6 is entering a market niche with tough competition. The Apple-inspired design could be anything between a key selling point and a major turn off. There may be a market for Android-powered iPhone 6 replicas but these are coming by the dozen from shady brands anyway and ZTE should be better than that. The Blade S6 can always point to the Lenovo Sisley for an excuse but we won't take it. On a positive note, ZTE has secured capable internals to make the Blade S6 a tempting package. If the price is right and they deliver speed, performance and image quality, to go with the pleasantly surprising Lollipop, they'll manage to put some pressure on the competition. We'll know soon enough. Coming up next is the usual unboxing and hardware checkup. Let's do this. 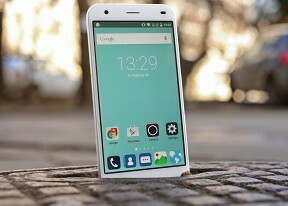 in zte blade s6 i faced a problem thai in this mobile only one sim slot use.not both..it is a very big problem for me. Why do I get a notification that this app is not available in this country? When i live i Brisbane and the DoDo portal app and GasBuddy (Australia) only apply in Austra;ia. I made 160 orders till now, i never had i problem.